Marion Correctional Institution currently operates as a combination close/minimum custody facility with 96 segregation beds. This facility houses adult male felons and is operated under the Unit Management concept. Offenders are assigned based on classification, reassignment, demotion in custody, administrative transfer from another close custody prison or segregation housing needs, and program needs. The computer training center for the Western Region is on site. McDowell Technical Community College provides academic and vocational classes. Courses include adult education and preparation for the GED, and horticulture. Offenders may also participate in the Outreach Program through the University of North Carolina-Chapel Hill and earn college credits. In an effort to assist offenders in bettering themselves, Cognitive Behavior Intervention classes are offered. Offenders may participate in courses such as Character Education, Reasoning and Rehabilitation, and Thinking for a Change. These courses offer offenders a different way of thinking their way through problems and offer them alternative thought processes to moral dilemmas. Minimum custody offenders at can participate in the Father Accountability Program. This program lets offenders see how important the role of a father is to children and in the family. Offenders completing this course should return to their families as a better and more responsible fathers. Offenders are afforded the opportunity to work on site or back in the community, where they provide needed services surrounding our prisons. Labor contracts are provided for governmental agencies to secure inmate labor and enhance services for the public. Offenders on work release have the opportunity to earn a wage working at a business in the local community. This allows offenders to develop job skills prior to release while paying any court-mandated fines and providing for their families. The New Leash on Life Program rescues dogs from the animal shelter that otherwise would be euthanized and puts them through an extensive eight-week obedience training program provided by trained offenders. Once the dogs have “graduated,” they are adopted by families. Many of the programs are offered with the assistance of community volunteers. These programs include structured recreational activities, Prison Fellowship, Yokefellows, substance abuse counseling, anger management, religions programs/activities, and self-improvement programs. Volunteers undergo training prior to being allowed to work with offenders. 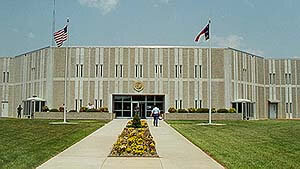 Marion Correctional Institution was established as a result of a $200 million prison construction bond referendum approved by voters in 1990. It was funded in two stages. The first 520 cells were funded in July 1991 and reauthorized in July 1992 as part of a $30 million construction project in the $103 million prison construction program. During the 1994 special session, the General Assembly provided $5,358,900 for construction of a 192-cell housing unit addition. In 1991, the McDowell County Commissioners purchased 125 acres formerly known as the Carl Holland Farm in the Rocky Pass community and donated the property to the state for construction of the prison. Grading of the site began in March 1992 and construction was completed in January 1995. Offender housing assignments began in June 1995. Marion was originally designed as a 660-bed medium security adult male prison, but was redesigned as a close and medium security prison with a capacity for 930 offenders because the state needed more high-security prison cells. Friday - 8:15 a.m. Phase III Lower H-Unit; 1:30 p.m. Phase III Upper H-Unit and Upper E-Unit . Offenders housed at the Minimum Custody Unit will have visits on Sunday from 1-3 p.m. No appointment is necessary to visit at the Minimum Custody Unit. Visits will not occur on holidays. In the event the scheduled visitation day falls on a holiday, an alternate day will be selected. Adequate notice will be given to offenders and posted throughout the visitation area. Visitors should arrive at the Gatehouse at least 15 minutes prior to the scheduled visitation time, bring proper ID, and will be subjected to a "routine" search of their personal and possessions prior to the visit. Take Interstate 40 west to N.C. 226 (exit 86 Marion/Shelby) and drive south about one mile. Turn right onto the Old Glenwood Road. The prison access road is one-quarter mile on the left.